Grilled Grouper is like a taste of summer anytime you fix it. 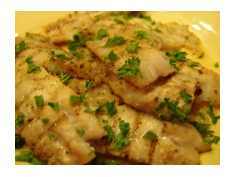 This Grilled Grouper recipe is easy to do, as long as you have the right equipment and follow some common rules of successful seafood/fish grilling. I became acquainted with Grouper when I started traveling to Florida and going on fishing expeditions. 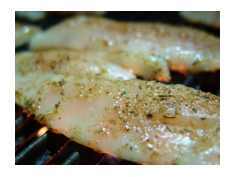 The fish has a milt to sweet flavor, and is great whether you grill it, pan cook it, broil it or fry it. In fact, fried Grouper sandwiches are a main stay in the Destin / Fort Walton Beach area. I won't get into the biological classification of Grouper, because frankly, I start smelling formaldehyde from my days in biology. To put it simply, Grouper is primarily a salt water fish that can become quite large. There have been reports of Grouper large enough to swallow humans. It has a large body with a large mouth, and swallows it's prey whole. Groupers like to eat other fish, lobster, crabs and octopus. The word "grouper" comes from the Portuguese word "Garoupa." Most people mistakingly think they are called "grouper" because they travel in groups. Fresh Fish: Fish should not smell "fishy." If you are buying the whole fish, make sure they eyes are clear and not cloudy. Proper Equipment: I cover this in the video, but please have a good, thin, metal spatula on hand. Preheat Grill: Make sure the grill is nice and hot, and then clean it. It doesn't hurt to rub it down with some olive oil. Don't Play With the Fish: Let it cook, and only plan on turning it once. Eat It Fresh Off the Grill: Fish gets cold fast. Sprinkle with lemon juice and fresh parsley. Simple Flavoring: In this instance I used Fuzzy's Poultry and Seafood Rub and Fuzzy's Kicker. 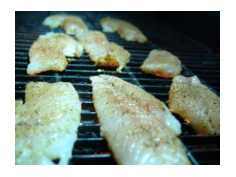 Leave Grilled Grouper and Return to BBQMyWay Home Page.